YOUNG Townsville man William Brennan has entered the priesthood at a time when the Catholic Church and priests are under more scrutiny than ever. Mr Brennan entered Holy Spirit Seminary at Banyo recently to begin his formation to become a priest for Townsville diocese. The young seminarian, who spent most of his childhood in Charters Towers, said he was almost pre-destined to be a priest. “I am one of four boys in my family and if any of us was to become a priest, it was me,” Mr Brennan said. William attended Columba Catholic College for most of his primary and secondary schooling before the Brennan family moved to Toowoomba where he attended Downlands College. After graduating from college he moved to Brisbane and spent last year living at a discernment house, Canali House, with eight other young men who were also considering a priestly call. “The year I spent at Canali House was a very special time for me (as) it allowed me to grow as a person and understand how the world works a bit and get into the workforce,” Mr Brennan said. Even though Mr Brennan spent two years in Toowoomba, North Queensland was always home. “Growing up in Charters Towers, it was always going to be a place that I wanted to go back to,” he said. “I had met Bishop Michael Putney a number of times, so he was an inspiration to me as well as knowing that the diocese had a shortage of priests. 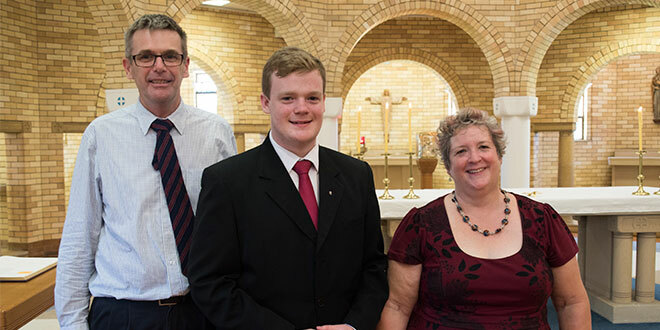 At the Mass to welcome in the new seminary year, Mr Brennan was joined by his parents Monica and Paul who supported their son’s decision to join the seminary. There are 25 young men in priestly formation at the seminary, including Emene Kelemete who is in his sixth year of formation. Townsville now has two men there who have answered God’s call to be priests. Purchase a copy of The Catholic Leader at your local parish or subscribe to receive The Catholic Leader at your door or inbox every week.